Many of you might be celebrating St. Patrick's Day by wearing green on Sunday - an Irish Tradition that is common in the United States. But even in Germany, St. Patrick's Day has become a widely celebrated event. While not all of us would consider a stout a real beer, we’re happy to join the Irish in their beer-drinking celebrations on the biggest Irish party of the year! 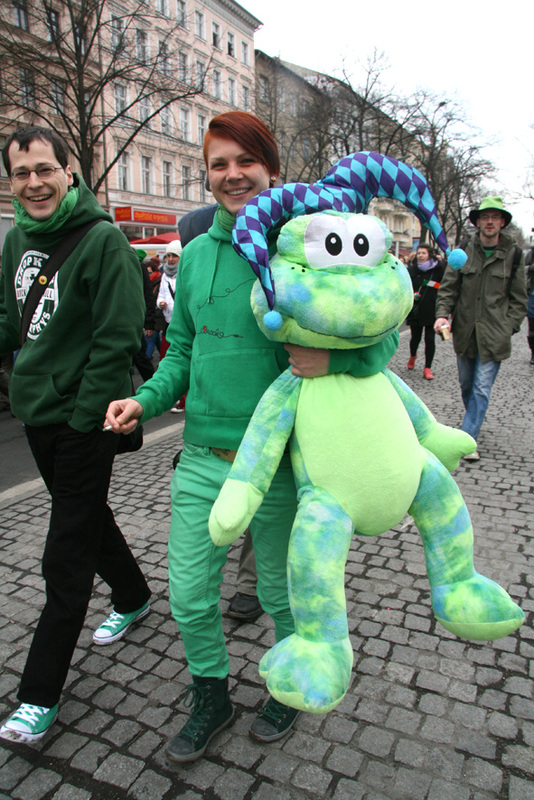 The city of Munich hosts the largest annual St. Patrick's Day parade in continental Europe. Often times, 30,000 people or more show up for the parade at Odeonsplatz, which often includes the mayor. The parade includes bagpipe performances, Irish dances and performers in costume. Approximately 1,464 people in 63 different performance groups will participate in this year’s parade. Irish people and St. Patrick's Day enthusiasts have been gathering for the Munich parade since 1996. And festivities are not limited to the parade: over the course of two days, there is also an Irish mass, an Irish cultural evening and gatherings involving Irish beer. "So many Irish people live here in Munich and we Bavarians are always up for a party," Anthropologist Sandra Meinas told the Irish Times. But even further north, Germans celebrate the Irish holiday, with Berlin hosting a smaller parade and festival of its own. Germany is home to a large Irish community; one estimate from 2013 claims there are around 11,000 Irish citizens who have declared German residency. So whether you are in the US or Germany this weekend, we're sure you will encounter more green than usual! Germany is celebrating its so-called Fünfte Jahreszeit ("Fifth Season"), which is a reference to Carnival! The Fifth Season officially began on November 11 at 11:11 a.m., but in actuality, Carnival's events take place during one week in February with highlights including Fat Thursday and Rose Monday. On February 28, Germans celebrated Weiberfastnacht (Fat Thursday), which marks the last Thursday before Lent. In the Rhineland - which is where Carnival is celebrated most intensely – work often ends before noon and people wear costumes out on the streets and in local bars. But men who wear ties on Weiberfastnacht need to be prepared: one of Germany's unique Carnival traditions is that women cut off men's ties with scissors on Fat Thursday, leaving them with nothing but a stump. After all, Weiberfastnactht means "women's carnival night", and this ritual allows them to symbolically strip men of their statuses. Even at the German Embassy in Washington, some of our colleagues had to say goodbye to their ties on Thursday. Be sure to check out the video in TWIG to see what happened! But the biggest celebration of Carnival is still to come next week on Rosenmontag (Rose Monday) - a day marked with large parades and street parties. An estimated 1.5 million people watch the Rosenmontag parade in Cologne each year. Although Rose Monday celebrations take place in Germany, Austria, Switzerland and Belgium, the region with the heaviest celebrations is the Rhineland, particularly in the major cities along the Rhine. The southern part of the Rhineland, however, has its own unique tradition called "Fastnacht", which comes with its own unique customs. Be sure to read about the history of Carnival in this week's edition of TWIG! But perhaps German humor is simply misunderstood. Many German words - especially compound word constructions - are lost in translation, simply because there is no equivalent in other languages. Our "Word of the Week" series should help you understand words as complex as Backpfeifengesicht ("a face in need of slapping"), Honigkuchenpferd ("honey cake horse") and Kabelsalat ("cable salad"). The more you understand Germany's strangest and most unusual words, the more humor you will find in the language! British comedian Stewart Lee agrees. In an op-ed he wrote for The Guardian, he said it took him a while to understand German humor - but once he did, he couldn't stop laughing. Much of English-language humor, he said, stems from words that have double or triple meanings, thereby creating humor that thrives on confusion. Since the German language has so many compound words and specificity, "it provides fully functional clarity". As a result, Lee writes, the German "sense of humor is built on blunt, seemingly serious statements, which became funny simply because of their context." "I looked back over the time I had spent in Hannover and suddenly found situations that had seemed inexplicable, even offensive at the time, hilarious in retrospect. On my first night in Hannover I had gone out drinking with some young German actors. 'You will notice there are no old buildings in Hannover,' one of them said. 'That is because you bombed them all.' At the time I found this shocking and embarrassing. Now it seems like the funniest thing you could possibly say to a nervous English visitor."